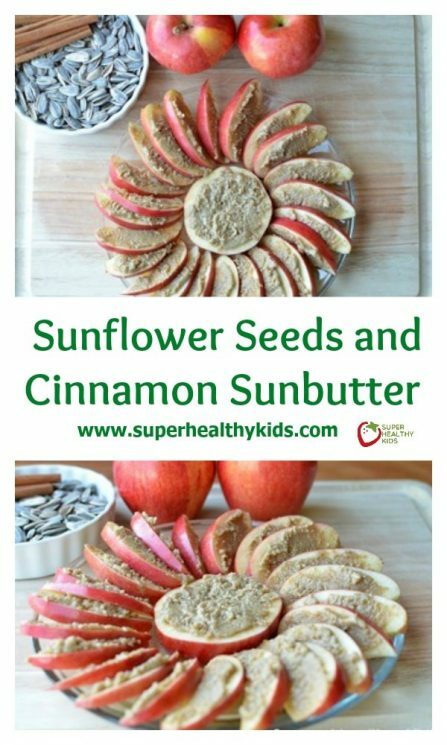 Sweet and salty Cinnamon Sunflower Butter makes a satisfying and allergy-friendly stand-in for nut butter. But before you pack yet another ham and cheese sandwich, take a taste of our Cinnamon Sunflower Butter! This creamy spread made from sunflower seeds provides similar nutritional benefits and flavor to nut butters, yet isn’t a common allergen. Plus, even if you love peanut butter, it’s nice to switch things up once in awhile. Yes, you can buy sunflower butter at most grocery stores. But we like to make it fresh in our kitchen for a few reasons. First, the commercial versions of sunflower butter contain a little more sugar than we would like. Second, they’re usually expensive compared to whole sunflower seeds. And third, sunflower seeds contain delicate monosaturated and polyunsaturated fats that turn rancid quickly after they’re ground. When we blend up this Cinnamon Sunflower Butter at home from whole seeds we source ourselves, we know our spread will turn out luscious and fresh! Vitamin E for reducing inflammation. Magnesium for healthy nerves and muscles. Sunflower butter is really easy to make at home. 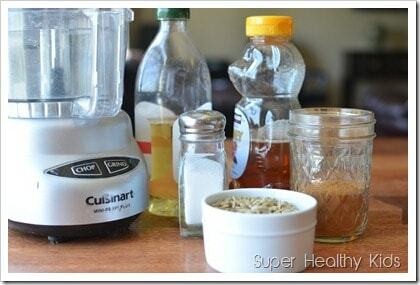 Your food processor does all the work for you! Check it out! First, assemble your ingredients. 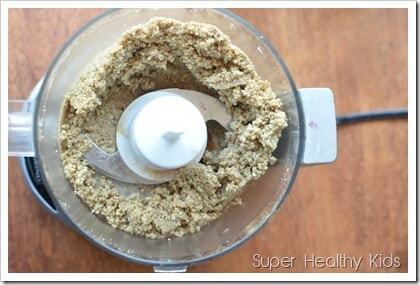 Then grind the sunflowers in a food processor until they become a powder. Then spread your butter on crackers, bread, apples, pita, waffles, or anything else you like, and enjoy! 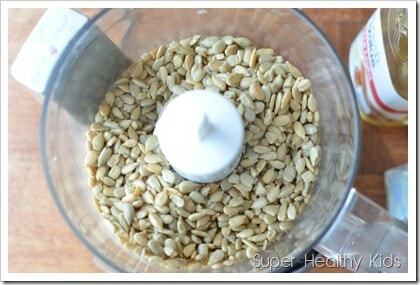 Puree seeds in a food processor until they become a fine powder. Add oil, honey, cinnamon and salt and puree again until the butter becomes smooth and spreadable. 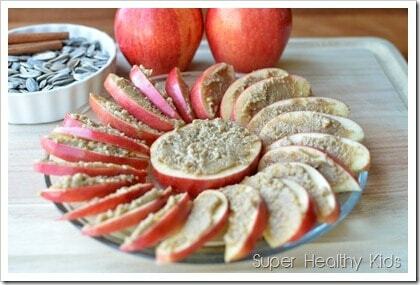 Spread on fruit, bread, or crackers, and Enjoy! Refrigerate leftovers and use within a month. Yummy! I love sunflower butter but sometimes it tastes a little bitter. I bet the tiny bit of honey and cinnamon make this delicious! 2 questions please: What is the best way to roast sun seeds and would this taste even better using coconut oil? Thanks!! The presentation looks lovely! I’ll try making this when my niece and nephews come over my place. 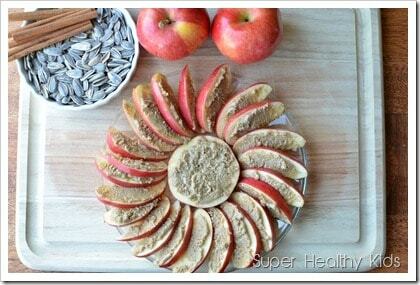 Any other fruits you can suggest to complement the honey cinnammon spread? 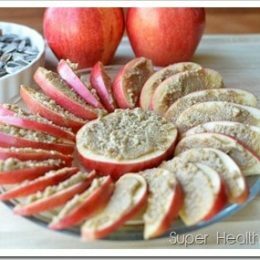 I could only think of apples and bananas, but it’s OK to get creative here! I roast them dry. Just spread thin on a baking sheet, a little salt sprinkled on, and baked only for about 10 minutes on 400 degrees. Coconut oil would be delicious! I bought sunbutter and it has a lot of sugar. I’m much more willing to eat this but it’s a little more prep work. How do you store it and how long will it last? I store it in the fridge, and we usually eat it within a week or so. We also just make small amounts at a time. So, I’m not sure how long it will truly last. This sounds great! I think we will try it this weekend. I love the rally caps in the picture. We just had our first game of the year last night. I have made sunbutter a few times and I have not needed to add oil. The longer you grind it in the food processor, the creamer it will get(like peanut butter if you want). Thanks AmyE I’ll try it without next time. My kids’ schools serve “Sun Butter” because it’s not an allergen for kids who have allergies to tree nuts! Kids at school actually appear to like it. I will have to make a batch for here at home and try it!! Thanks!! 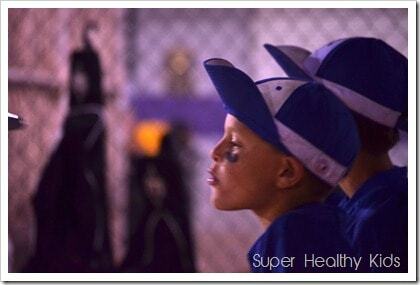 Many common brands of sunflower seeds may have cross-contact with peanuts or tree nuts. Must read labels to know that this is truly allergen-free for kids with food allergies!